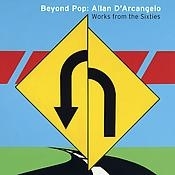 Like his Pop Art contemporaries, Allan D'Arcangelo found inspiration in the everyday and in mass culture. The artist incorporated commercial packaging, popular personalities, and advertising logos into his compositions. 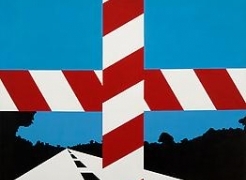 However, it was American highways, road signs, and the visual language of the country's modern terrain that particularly inspired the artist. His crisp compositions are infused with iconic symbols familiar to any traveler and his simplified perspectival landscapes put the viewer squarely in the driver's seat. As his oeuvre developed, he added overlapping barriers to the scenes, both painted and superimposed with actual objects that obscured the hard-edged vistas. These works, which are referred to as "Barriers" ultimately, led to his "Constellation" series that further refined the images into abstraction. The exhibition will present approximately twenty representative examples of these various styles dating from 1962 to 1970. The show is accompanied by a catalogue which includes an inspired essay by art historian, Eileen Costello. Dr. Costello is the Editor and Project Director of The Catalogue Raisonné of the Drawings of Jasper Johns; an Adjunct Professor, Hunter College; and Primary Researcher for the Ad Reinhardt Catalogue Raisonné of Paintings and Works on Paper. She is also working on the Brice Marden Catalogue Raisonné of Paintings and Works on Paper. Her in-depth research and fresh perspective on D'Archangelo's work will most definitely add to the scholarship on this artist.